Over 1,100 chords, 1,300 chords, and 1.300 arpeggios, all in one book. With the Guitar Chords, Scales & Arpeggio Finder, you can easily learn to master the entire guitar fretboard. 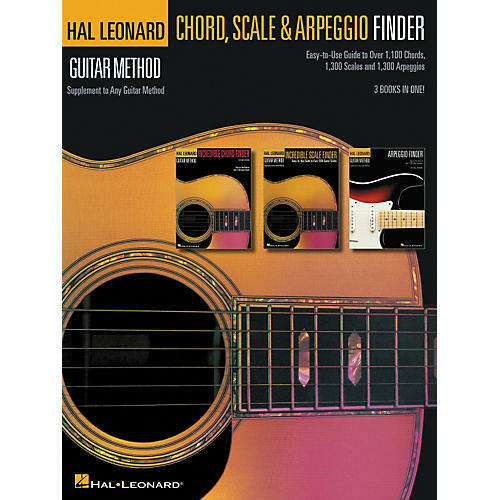 Part of Hal Leonard's Guitar Mehod Series, this comprehensive reference guide contains three voicings for the 31 most important chord types, diagrams for 17 essential scales types, and 28 arpeggio qualities for each key presented in four different shapes. Basic music theory is also included to assist in using this book. This is an ideal guide for any guitar method. Order now!